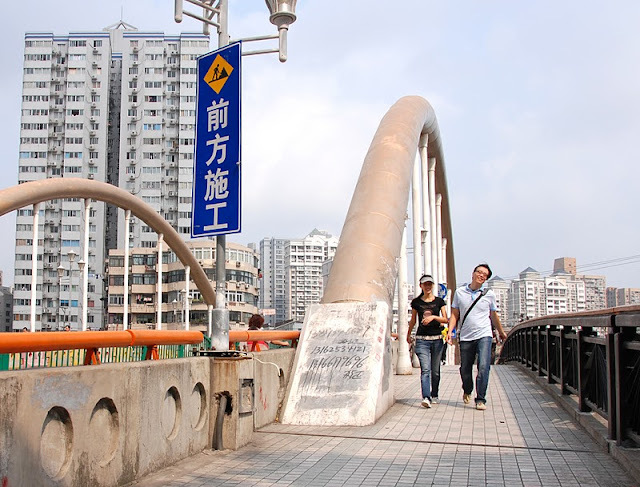 A view from the deck of Wuzhen Road Bridge. As I've mentioned previously, I was impressed by how relaxed and happy people are in Shanghai. There's a concrete block protecting the arch rib at the sidewalk. Someone has written on the block a phone number for people to call who want a fake identity card. There are too many people moving into big cities and so the government issues ID cards to try to prevent this migration. Note that the bridge has a second, interior barrier rail to protect the arch ribs and hangers from errant drivers. The outside barrier rail is decorated with wrought iron and the sidewalk is decorated with tiles. Shanghai China's Bridges: Wuzhen Road Bridge (2) by Mark Yashinsky is licensed under a Creative Commons Attribution-NonCommercial-ShareAlike 3.0 United States License.